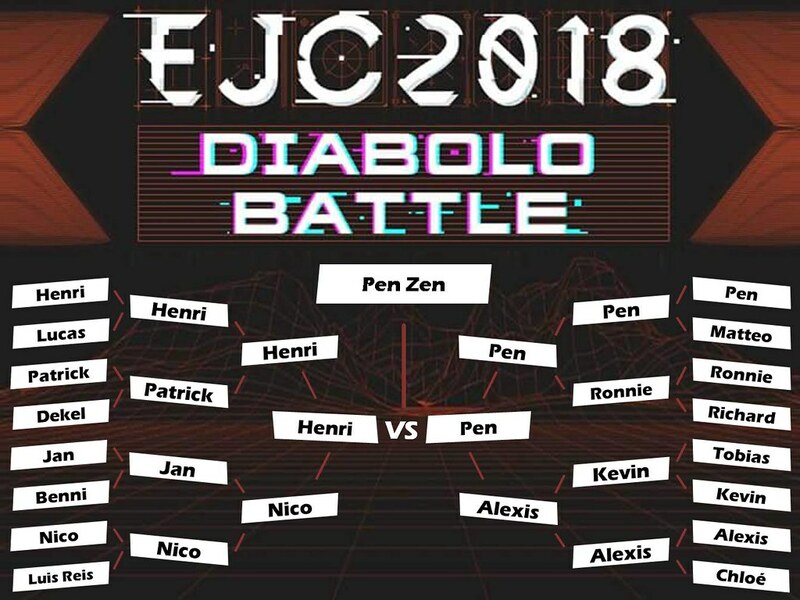 The EJC Diabolo Battle 2018 took place and it was amazing! We have got amazing feedback from everybody that attended. We had a great venue a bit limited in capacity, but the battle atmosphere was bananas. We had the first 5 low run that is maintained on stage, thanks Pen Zen for that. Naoya Aoki - Champion in 2015. Amazing style, and great knowledge of the whole juggling community. Read his Japanese magazine about juggling, Ponte. The final between Pen Zen and Henri was amazing, extremely high technique against supreme creativity. Both with super clean styles. Congratulations to both of you! And to all the players that made it to the finals! Here Luke saying the the Diabolo Battle was his High of the EJC!! big pleasure to participate on it! Videos coming soon as well! amazing work Wis! this really contributes to push the level of diabolo higher!